1. This is the song that got me an “explicit” warning for the Hearts For Bullets CD since it has swearing in it. I thought this was a GOOD use of the “F” bomb. 2. This song was a collaboration and is the only song on Hearts For Bullets that I didn’t do the majority of programming and writing for. 3. I occasionally get tagged as “rap” on some sites. I think it’s because of this song, and The Gun Song. Despite the fact that I hate when people try and categorize my genre of music, I DID think it was very entertaining to be called a rapper! 4. The tempo of this song is 101 BPM. Which is such an awesome speed that’s rarely done these days. This tempo used to be more common in Industrial (think Nitzer Ebb’s Belief album and NIN songs) but with club music that’s taken over, DJ’s and/or artists seem to think that if a song goes under 130 BPM, they might explode… or something. 5. The original working title for this song was “I look better from the floor”. 7. This was the very last of all songs to be finished in production for Hearts For Bullets around mid June 2008. After which, I had a glass of red wine to celebrate! This song is a collaboration between me and my amazing friend Jeremy Pfohl who happens to run Storming The Base in Toronto. I actually love collaborating with other people. Some amazing vocal ideas have come out of collaborations since I’m free to concentrate just on the vocals which has always been my number one passion. Jeremy had started writing this loop that eventually became the first verse of “Blue Alice”. He played it for me, and I thought the synths were just amazing, and it had such a cool groove and such a rawness to it, that I asked him to pass the loop on to me so I could play around with ideas since he tends to just start loops just for fun. I then recorded vocals over top of it, that ended up staying in the sonng as the first verse. I had started chanting about fairy tales through a distortion effect, and he loved it so we decided to develop it further and complete it as a full song. Writing the chorus came next but we found it really difficult to transition into something big and powerful. Both the music and the vocals in our first draft, neither of us liked completely. The first draft of the song, I had kept chanting in the chorus but it really needed some vocal melody to change the chorus completely. Then one day, the “Hey You Black and Blue” came to me and it was a line that instantly stuck in my head and forced Jeremy to program percussion around that new idea. It’s like everything clicked once a powerful chorus was created. [podcast]http://www.ayria.com/wp-content/uploads/Chorus-Synth-Solo-1.mp3[/podcast] [podcast]http://www.ayria.com/wp-content/uploads/Chorus-Synth-Solo-2.mp3[/podcast]Finally the Bridge Synth “solo”! The Lyrics: This Is One F*cked Up Fairy Tale..
Don’t End Up Like Alice: The rest of the lyrics, I took from other favourite childhood stories, like Alice In Wonderland of course, which became the premise of the chorus and tied the whole song together, matching the tone of the verses by portraying a bit of a battered Alice who ends up black and blue and slapped around. I was already writting these dark lyrics, so there was no turning back and I created this image of an abused Alice that you have to be careful not to end up like. A bit unnerving, but striking. 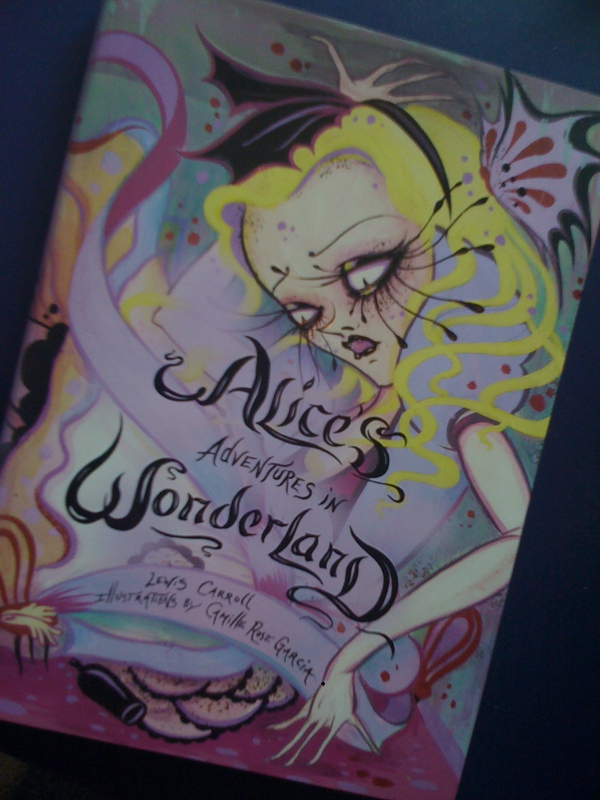 I recently purchased this Alice in Wonderland book and was thrilled with the illustrations in this version done by Camille Rose Garcia. They are so wonderfully creepy! The Little Pig reference was obviously a nod to the childhood nursery rhymes only mutilated to be about the pigs being nasty masochists, beating and choking Alice. The “Off with her head, Snakes are seething” is a reference to Greek Mythology’s Medusa, but also tying it in with the Queen Of Hearts from Alice In Wonderland, linking the fabled beheading of Medusa with the Red Queen’s constant cry of ‘off with their heads!”. Medusa is one of my favourite “villains” in stories.. although, arguably, not a villain at all, but that’s another discussion.. I also really liked the anachronistic images of the characters. Like the wicked witch overdosing on pills. Taking a fantasy character and giving her more modern qualities. Same with the image of the dragon, except in his case, he’s also a creature not a person, so having those modern qualities is even stranger. Instead of breathing fire, he takes a drag of a cigarette and blows the smoke into your face. Almost more insulting since you know he can breath fire, but is instead taunting you. And that being both anachronistic and anthropomorphic (yes, I looked that word up, I learned something from this blog too!) was interesting to me. To end the disscetion, I like sharing interesting youtube videos I stumble accross! This one is a slide show created by fearandloathinggirl, it uses a lot of Alice Pictures that I’ve never seen before! Have a great week! I’m not going to post a new dissection this Friday and we’ll see how crazy things get, but this might be the last one before the upcoming tour. I will instead be tour blogging from the road! The Song Dissections will resume when I’m back of course! In the meantime, tell me what your favourite fairy tale, fairytale related movie, or childhood fable is? 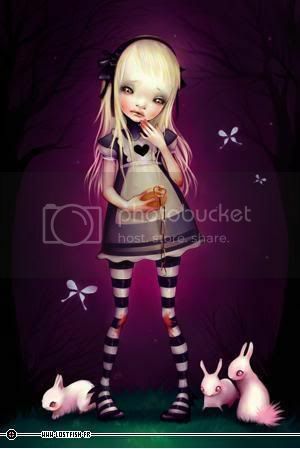 This entry was posted in Song Dissections and tagged Alice In Wonderland, Ayria, Blue Alice, Dissecting Hearts for Bullets, Hearts for Bullets, Lyrics, Song Dissection, Storming The Base, Videos by Ayria. Bookmark the permalink. Its nice to hear the song broken down – I don’t have a big understanding of the music I listen to, but I’m getting there haha. Since you asked: Alice in Wonderland was always my favorite,but so was The Wizard of Oz. I used to make mom read Dr. Seuss repeatedly to me. Also, I was always way into the King Arthur and Merlin stories. Morgana was always one of my favorite “villains”. AND,I used to read my big book of nursery rhymes over and over again,as a child. That’s what I can remember,for the moment! Thank Jennifer, and have a great tour! This is one of my favourite songs from Hearts For Bullets, I’m so glad you did a dissection for it! I like Alice in Wonderland a lot, but I think my favourite fairytale would have to be Little Red Riding Hood. This is indeed an awesome song, and I do appreciate the dissection of the synth pieces (sing I can’t sing, I’m trying to create synth music and these insights are wonderful). The synths do sound sick! I love it! As always, I was mostly wrong about this song, too 🙂 There is so much more there than I realized – right back to Greek mythology! I had envisioned it simply as an excellent vituperation against abuse, but there is so much more to it in allegorical terms. Bloody brilliant! My fave fairy tale is probably Little Red Riding Hood; so well restyled by the film “Company of Wolves”. I always thought fairy tales were full of creepitude, you synthesized (pun intended) them into a great badass song. Woop woop! Jenn the rapper 😉 I never really got what this song meant but when you sang “This is one f*cked up fairy tale” I remember saying “hell yeah it is”. The synths also sound amazing! When I first heard this song [repetitive much? ], I remember hearing “its off with her head, snakes are seething” I was like omg greek mythology! MEDUSA! [yes i’m a big mythology nerd]. My favourite fairy tale when I was a young one was probably sleeping beauty. as for a movie, I can’t quite think of one. But anyway, this song is amazing nonetheless. The synths, vocals, everything. Good luck on your tour and I hope you have fun! My 2 favorite movies are not fairytales but I loved them growing up & own them currently. The Aristocats & Secret of Nimh. Great read as ever, I love this track. Have a blast on the tour, I’m sure it will go excellently. I love this song. It was one of the first three songs I owned before I completed all my Ayria albums. I’m hoping I’ll get to see you live, but I need parental permission. On an unrelated note, I received my poster and buttons from you today! It was (and is) very thrilling. Thank you so much!!! This has been one of my favorite dissections yet! I love this song and i love how sick it is! I love learning so much about your work! Im excited to see what the next one is! Thank you for sharing!!! I simply love your weblog! Very good submit! Still you are able to do many things to improve it. Before you make any purchase of baby furniture you should always research prices for best functions and designs you like and your youngster’s specific taste as well as liking; because you usually want to provide the best things to your infant but at the same time, you need your home to come up with a sense of great taste. 31. I do agree with all the ideas you have presented in your post. They are very convincing and will definitely work. Still, the posts are too short for starters. Could you please extend them a bit from next time? Thanks for the post. All people deserve very good life and personal loans or credit loan can make it much better. Because freedom is grounded on money state.